Situational awareness: Apple CEO Tim Cook issued a strong call to Congress to pass privacy legislation via a Time op-ed. And, I was able to put some old tech industry knowledge to use today. Read on to see where. CEO Satya Nadella doesn't think Microsoft alone can solve the housing crunch in the Pacific Northwest, but that isn't stopping the company from investing $500 million in affordable housing there. Why it matters: Tech companies have been widely blamed for making their hometowns unaffordable for anyone not in their industry — and even for some of their own workers. The ambitious investment suggests that at least some tech companies are warming up to the idea of using their healthy balance sheets to invest in the communities that have helped their businesses thrive. In making the announcement, Microsoft noted that jobs in the Puget Sound area have grown 21% since 2011. In that time, median home prices have nearly doubled, while median income has risen by only a third. The big picture: Some tech companies have embraced a role in dealing with housing costs and homelessness, while other companies have fought efforts to boost taxes. In San Francisco, Salesforce fought for Prop C, which significantly raised taxes on the city's big companies to pay for a comprehensive anti-homelessness effort. But other tech CEOs — including Twitter's Jack Dorsey, Stripe's Patrick Collison and Zynga's Mark Pincus — opposed the measure, which eventually passed. And in Seattle, Amazon had led the fight against a per-employee tax that was earmarked for dealing with those issues. The company points out it has also donated roughly $40 million to nonprofits working on homelessness, including a shelter in its office building, and another $40 million towards affordable housing projects in Seattle. 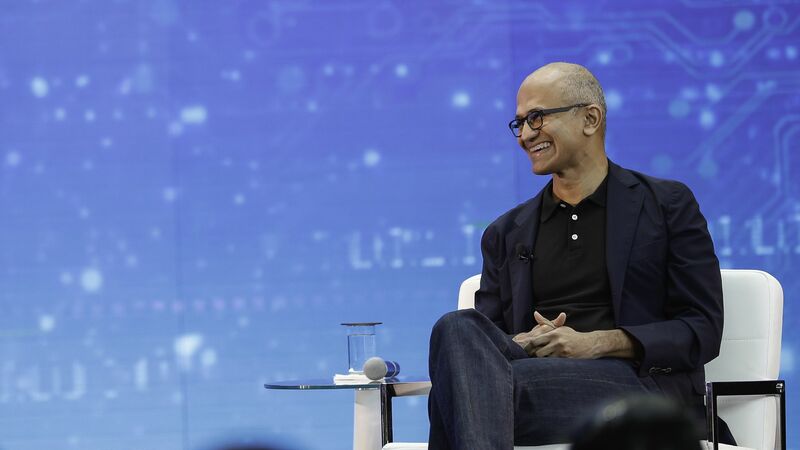 Nadella noted that Microsoft employs more than just software engineers, relying on cafeteria workers and shuttle drivers as well as those who write code. "We don’t have enough affordable housing units that then can be bought by people in these jobs. We’re going to invest quite a bit. Microsoft can’t solve this by ourselves. But we should do our fair share to create more supply. It’s a supply problem. There’s a market failure that we need to go work on. That’s what we’re going to do." Brad Smith, Microsoft's president and chief legal officer, added that while the tech industry has created jobs in places like Seattle and Northern California, it has also made home ownership a challenge for teachers, first responders and even some of those who work at the tech companies. "What it’s required them to do is live farther away and spend more of their day commuting. It has undermined the health of the communities in which our companies are prospering." Be smart: Investing in affordable housing is a socially responsible move. But the tech companies benefit, too. Skyrocketing housing prices make it harder to recruit new talent, especially entry level workers with lower salaries. Plus, tech workers at all income levels want quality schools and transportation, services which suffer when teachers and bus drivers can’t afford to live there. In the Trump administration's latest effort against Huawei, federal prosecutors are exploring criminal charges against the company for stealing the intellectual property of business partners, according to the Wall Street Journal. Details: The allegations stem, in part, on a years-old case in which Huawei workers stole part of Tappy, a cellphone testing robot used by T-Mobile US, which sued Huawei in 2014. In a move that was unusual in a corporate dispute, Huawei contested the legal case but admitted that 2 of its workers, later fired, had done some of what T-Mobile alleged, while regretting that the matter had proceeded to litigation. "There is some truth to the complaint in terms of two Huawei employees acting inappropriately in their zeal to better understand a customer’s quality testing requirements," a spokesperson told me at that time. The jury sided with T-Mobile in 2017 awarding damages. Our thought bubble: It certainly was a bad look for Huawei, costing them business here and hurting their reputation. But it's a really old case to be basing new charges on. Nonetheless, it joins other current concerns including how Huawei is dealing with U.S. sanctions as well as issues related to 5G. Facebook said Thursday that it has removed hundreds of pages and accounts that pretended to be real news sites from places in Eastern Europe, but were actually operated employees from Russian state-owned news company Sputnik, Axios' Sara Fischer reports. T-Mobile CEO John Legere, who has carefully crafted his image as a customer-friendly maverick, drew significant criticism Wednesday after the Washington Post reported that he and other executives have been spending a lot of time in Donald Trump's D.C. hotel since announcing plans to buy Sprint. Why it matters: The move appeared to be a way to curry favor with the leader of an administration tasked with deciding whether the Sprint deal goes through. Legere denied it was an attempt to sway regulators, tweeting "I respect this process and am working to get our merger done the right way. I trust regulators will make their decision based on the benefits it will bring to the US, not based on hotel choices." Many of his followers, though, felt the actions spoke otherwise and expressed disappointment in him and T-Mobile. Flashback: This actually isn't the first time Legere's stay at a Trump hotel has been in the news. He famously was staying at one back in 2015 and complained about loud noise outside his room. Trump responded by criticizing T-Mobile's service. Legere responded by immediately checking out while the dispute continued on Twitter. But, Legere piped down as Trump ran for president and T-Mobile has said little publicly about the president or his administration. Amazon today announced plans for re:MARS, a new conference that will be focused on topics like machine learning, automation, robotics and space. The event will take place June 4–7 in Las Vegas and include speakers from Amazon as well as a number of leading academics. Context: It's an extension of a more private event, MARS, that had been run by Amazon CEO Jeff Bezos, which he dubbed "summer camp for geeks." Netflix reports earnings after the markets close. The North American Bitcoin Conference continues through Friday in Miami. Facebook hired veteran Google engineer Ryan Cairns to lead its Portal effort, with Rafa Camargo shifting to lead AR and VR hardware. In other Facebook news, Sydney Paul, most recently the former senior legislative counsel for Sen. Gary Peters (D-Mich.), joined the company this week as a member of its congressional lobbying team. I'm a sucker for the U.K. Parliament's rituals and this video of Speaker John Bercow trying to bring things to order is amazing.